Marketplaces. They’re all the rage. In fact, the media can’t stop talking about them, people can’t stop searching for them, and investors have deployed $2.4 billion in just the last seven months. So what’s a marketplace all about? First of all, it’s not a new concept. It predates Airbnb and even the birth of the Internet. The ancient Greeks called them Agoras. Marketplaces go back to the earliest civilizations when farmers and villagers gathered at a common location, usually in a town square. We get the words “agriculture” and “agoraphobia” from the original koine Greek word. Above Image: Click to see a sample of dozens of marketplaces in six major verticals, read the full post. 2) Providers of resources, someone who offers them. 3) Partakers of these resources, someone who receives them. Here’s a few examples to help illustrate, using the same categories as the Honeycomb image above. You may wonder why these marketplace companies (the Platforms) are performing so well. It’s because they enable seamless transactions, regardless of locations or social relationships, and they take a cut of the revenues at scale. They have recurring revenue without owning most of the liability – they are efficient, money-making machines. Additionally, these platforms offer a number of features that enable smooth transactions, including, but not limited to, inventory management, profiles and reputations of Providers and Partakers, payment systems like Stripe or Braintree, matching software, and marketing services to amplify all services involved. They also offer on-boarding services, customer care, insurance, and lobbying at the government level to further empower their business. Big corporations won’t stand by idly and allow the market to displace them. 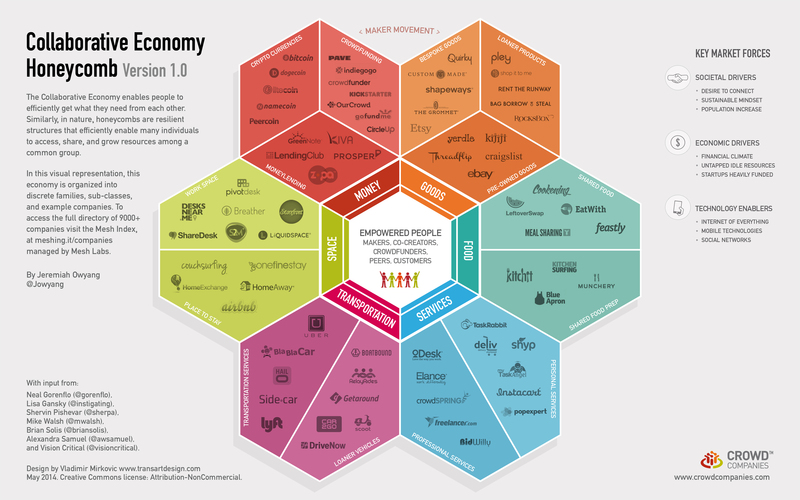 We’re already seeing big companies host their own marketplaces, turning a two-sided marketplace, into a three-sided one (Providers, Partakers, and the Brand Product), offering value added service) like Patagonia’s Common Threads marketplace, GM and RelayRides enabling used cars to be shared, and Coca Cola offering a workforce marketplace with Wonolo. In summary, marketplaces aren’t new, but they are now being created for just about every vertical niche, location, and need. They’re becoming more efficient as they utilize emerging, new technologies to find idle resources on demand. And they are heavily funded. Not all marketplaces will succeed. Recently, Menlo Ventures hosted an event where we shared the lessons learned regarding what works, and what doesn’t. I hope this post provided additional clarity, to dissect how this growing market works. Disclosure: Coca Cola is paying member of my company, Crowd Companies.